As spring fast approaches us, I wanted to share a fun and functional list with you that will come in handy as you start to detox this season, and beyond! Coconut oil is one of my favorite gifts from Mama Nature – anti-bacterial, anti-viral, blood-sugar-balancing, and detoxifying – and if you haven’t yet, I think you’ll fall in love with it too after reading this. Coconut oil isn’t just great for your skin and hair, it can also help you to heal your thyroid, lose weight, have more energy, and fix your periods. It only takes two to three tablespoons per day for coconut oil to have these wondrous effects on your health. Coconut oil is the ultimate “good fat” as it contains medium chain triglycerides or fatty acids that are hormonal health warriors. Over the years, we’ve all been educated to fear oils and see them as fattening and unhealthy. Well, some are – like vegetable oils, canola, safflower – but coconut oil is actually completely unique and has many health benefits. Hormone balancing – the fatty acids in coconut oil actually help the hormones get to where they want and need to go in the body, and so support the creation, processing and elimination of estrogen and progesterone, leading to hormonal balance. Weight loss-promoting – studies show that coconut oil increases the metabolism and prevents hunger, allowing for successful weight loss. Thyroid-supportive – coconut oil has the ability to transform cholesterol into pregnenolone, which is one of the essential building blocks for thyroid hormone-creation. When you add more coconut oil to your diet, you’re increasing the saturated fats made up primarily of medium-chain fatty acids that aren’t found in many other oils. These medium-chain fatty acids increase metabolism and promote weight loss, which is a big part of your healthy thyroid function. In addition, coconut oil can increase basal body temperatures, which is super important for women with low thyroid function. Gut-healing – coconut oil repairs gut tissue and encourages the growth of good bacteria in the gut. Like breast milk, coconut oil is powerfully antimicrobial and antibacterial. The high levels of lauric acid in coconut oil protects against infection from viruses, bacteria, yeast, parasites and fungi. Lauric acid inactivates harmful microbes in your gut that can lead to hormonal imbalance. So, now you know how great coconut oil is for your health, how do you get more of it? I have some ideas for easy, simple ways to add coconut oil to your every day life. Stir a tablespoon into your favorite hot drink. Use it to cook your eggs and greens in the morning – it takes away that bitter taste of collards or spinach. Substitute butter for coconut oil when baking breads and desserts, or spread on gluten free toast. Just take a tablespoon straight from the jar when you’re short on time, like you might with a nut butter. I keep three jars in my house – one in the kitchen, one in the bathroom, and one in my daughter’s room! Coconut oil is so versatile. As a moisturizer. Ditch the store-bought moisturizers that are usually loaded with hormone-disrupting chemicals, and swap them for coconut oil. Not only does it provide lasting moisture to your skin, but it’s antibacterial properties can help fight acne and other skin conditions. As a mouthwash. More specifically called an “oil pull,” 1 teaspoon full of coconut oil can be swished through your mouth for 5 to 20 minutes and it will literally pull away the plaque and bacteria in your mouth. This is obviously great news for your oral health, but did you know that our oral health also has a huge effect on our heart health and hormonal health? It’s true. In fact, gum disease can add on an extra 2 months for the time it takes to get pregnant, according to Australian research in 2011. As an eye make-up remover. Instead of spending top dollar for pricing eye-makeup removers that most likely contain harmful chemicals, let coconut oil take care of it for you! Using a tissue or pad of cotton, wipe coconut oil across your raccoon eyes or other old makeup at the end of the day and watch it clear away everything fast! As a natural deodorant. Yet another way to avoid harmful chemicals from skin care products! Skip the anti-perspirants and roll on something that is effective and not harmful to your hormones. Coconut oil is an ingredient in quite a few natural deodorants, and you can also make up your own potion – either use it plain or mix it together in one of these DIY recipes. If you’re like me, you also care deeply about the quality of the food you eat. That means organic, non-GMO food, which unfortunately usually mean high price tags and giant weekly grocery bills. Coconut oil can be expensive, especially if you want it to be organic, ethically-sourced and of the virgin variety, which is important for the quality and taste, but it also means it will definitely have all the health benefits promised in this post. That’s why I can’t stop sharing Thrive Market – a online site that makes healthy living a whole lot easier and more affordable than ever (becoming a member costs less than $5 a month!). Think Whole Foods products at Costco prices, with the convenience of Amazon. Thrive is not only cheaper than upscale markets like Whole Foods, but it often matches or even beats prices at discount online retailers like Amazon and Vitacost. I’ve partnered with Thrive Market to bring you a great deal. You’ll get a free jar of the best brand of Coconut Oil that I use at home, as well as a month’s free trial and 15% off your next order. It is listed that coconut oil is great as a hypothyroid remedy, my question is: how should it be used to help hypothyroidism? I don’t clearly understand if using it as a moisturizer, deodorant, mouthwash, and eye makeup remover are recommended for those suffering from hypothyroidism. Please clarify, thanks! Great question! You can use coconut oil in your cooking and can also just take a teaspoon of it every day to benefit your thyroid. B8t im not sure how to take it? I have been adding it to. My morning coffee and cooking my eggs with it , if I have a salad for lunch I warm it a little and squeeze some lemon or lime in it and toss it with my greens , it tastes really good . I usually eat the kale spinach mix, with sunflower seed and dried raisins or cranberries ..I add a little cheese but not much . I’ve been using the coconut oil for hypothyroidism for the past 3 months I nowgo for my thyroid-test and the tsh is low what am I to do ? to stop using the coconut oil? Hi everyone! I started taking coconut oil in my coffee and tea and it’s been delicious! But, I’m in doubt about the correct daily dose… is it 1 or 2 tbsp? is 3 too much? I heard Alisa saying that a jar lasts 3 months and mine is half empty in just 2 weeks… so, just checking that I am not abusing it. I haven’t had a cycle in months and started taking coconut oil I also started my cycle there is some truth to this…. What kind of coconut oil did you use as I have extra Virgin coconut oil? I having the problem of harmonal balance, is it true that coconut oil help me, and also how much I want to eat daily to solve my problem. 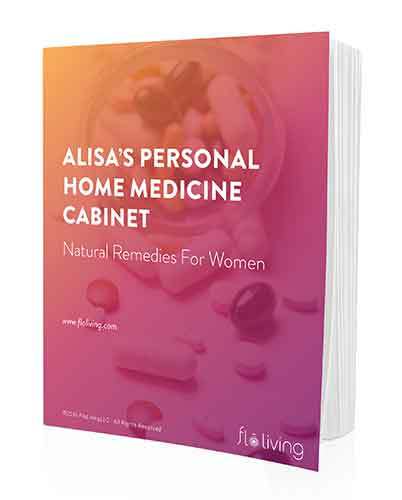 Hi Ammu, If you have a hormone imbalance it is important to understand what your symptoms are telling you – which hormones are out of whack will help you decide what you need to do! If you pick up a copy of WomanCode that I wrote you will get a lot more info on the topic. Hi! 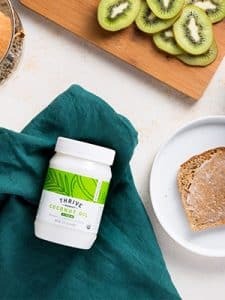 I live in Canada and currently Thrive Market does not ship to Canada. Do you have a suggestion for something similar for Canada? I have been using coco nut oil to cure an yeast infection and within two days the irritation and itching was gone. I was also on my period while having the yeast infection so i didn’t know if the coconut oil would work. I lathered my lady part and my tampon with coconut oil just to cure the yeast infection and it did. What i didn’t know was that the coconut oil would stopped my period completely. The coconut oil was so soothing and refreshing i’m thinking of adding it to my normal period routine. I m 38 and my period stopped all off sudden, Dr gave me nemothernow it’s three months I still don’t have any sign of periods please help me with this. Hi I have a condition due to low estrogen.Rhe dr told me I have to take preparing for life.Will coconut oil help this.How much do I take.I take it now for general health one tablespoon a day. You will want to take a more comprehensive approach to balancing your hormones – there is no one food or supplement that can fix it. A good place for you to start could be reading my book “Woman Code” – you will get a lot of info here on steps to take! Does coconut oil stop your period or helps your period come on!?????? and how do I take it? As well and I am 54. I have just started natural hormone therapy and doc it oil as well but I am unsure if this is the right thing to do? Can you advise? Currently we do not work with women in menopause. However, there is a lot that you can do by keeping blood sugar balanced, supporting good digestion and perhaps adding in some supplements (which ones specifically would need to be decided with a naturopath or someone like this). The more stress there is on the body the more likely it is to get out of balance. I would start by understanding which hormones are out of whack and then pick up Christiane Northrup’s book “Women’s Bodies Women’s Wisdom” – she is amazing! I have seen a lot of misinformation about hormonal issues. My estrogen is low and my cortisol high and low. I was advised to take adaptogens, flax seed, sesame seed, cruciferous, green tea and others. After a year on this diet I found myself in worst condition as before. I started googling and I found out the diet I was following was making me sicker because this things are estrogen blockers . If you are in menopause I suggest you do more research on coconut oil to make sure is not going to lower more this important hormones.